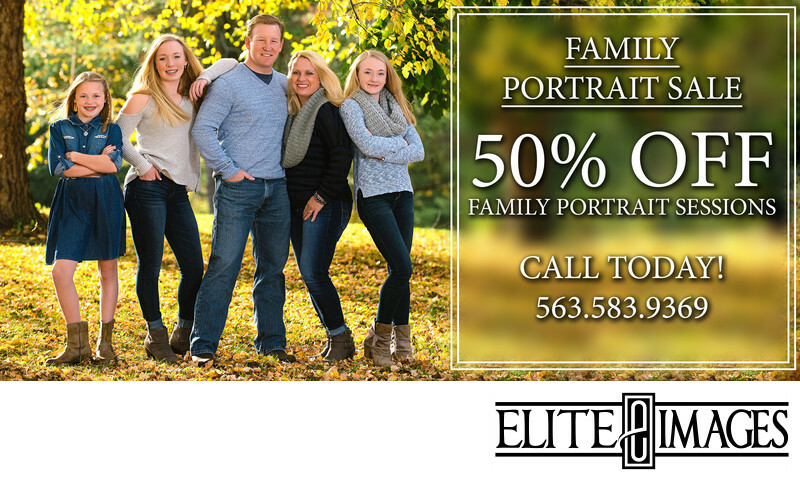 Get 50% OFF Family Portrait Sessions When You Schedule In OCTOBER! Fall is finally here! The weather is getting cooler, the leaves are changing colors, and you can finally break out your favorite sweater that's been shoved in the back of your closet! Know what else Fall means? Now is the perfect time of year for family portraits! SAVE 50% on your Family Portrait Session when you call to schedule NOW through October 31st. Spots are filling up quickly, so don't wait! Ready to take advantage of this special offer? Give us a call at 563.583.9369 and we'll help you set up the perfect time for your Family Portrait Session! Or fill out the form below and we'll get in contact with you! *Retainer due at time of scheduling.